I'm sure I'm not alone in come pay day having amassed a long list of beauty products that have been down whilst reading blog posts and watching You Tube videos. This month as you can see I had a bit of splurge having added some money to my paypal account from eBay sales. The Real Techniques Core Collection has been added to my brush stash and the Mac 217 is sure to change my world and aid my ability to perfect the smokey eye. The Shu Umera eyelash curlers have been on my wishlist since watching the Devil Wears Prada. I've always resisted but with a £10 Space NK Ndulge voucher due to expire meaning they were half price it was surely a bargain? My faithful Liz Earle Eyebright is due to run out so I decided to try two new brands this month, one high end and another drugstore. The Clarin's eye make up remover has been raved about in blog circles so I hope it's a worthy contender and as I was adding the L'Oreal Micellar Solution to my shopping bag I thought why not add their Absolute Make Up Remover too. I find being a contact lense wearer that I need to ensure my eye make up is removed properly - especially since my optician ticked me off for having make up in my eyes on my last visit! 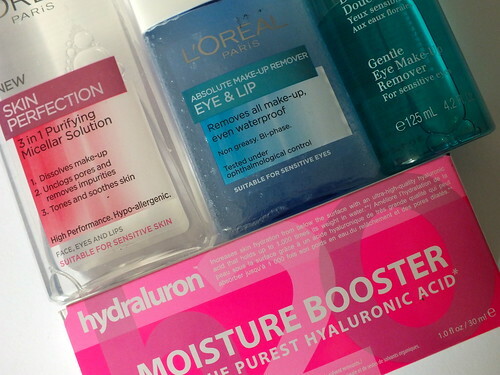 I've been eyeing up the hot pink Hydraluron Moisture Booster every time I walked through the Boots aisles and finally it is mine. I've yet to add it to my skincare routine but when I do I hope it makes the great impression on me that it has on everyone else. Superdrug were running a too hard to resist 3 for 2 offer on Nail Colours pay day week and since I've been obsessing over the yellow Bourjois for weeks it was the perfect opportunity to try Lychee and Guava from Barry M - yes for someone who said they didn't like the Gelly paints I seem to be amassing quite a collection. Likewise for someone who was rarely wearing any mascara why I felt that I couldn't resist buying the Clinque bottom lash mascara I don't know but into my collection it has gone. 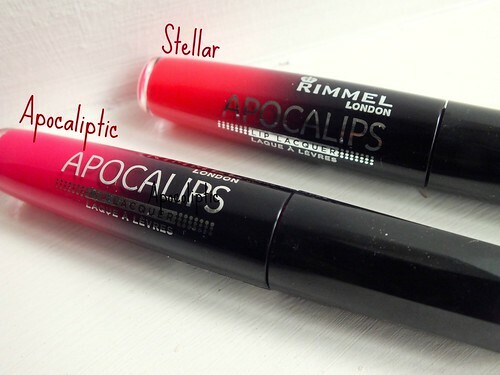 I've recently discovered that I'm something of a lipstick junkie and had been swatching the Rimmel Apocalips almost daily when I'd nip into Boots 'just for a look'. I decided to pick up Apocaliptic a bright fuschia which I wore in this post and Stellar a red orange. So far I've found Stellar easier to work with. Apocaliptic led to my friend constantly telling me to lick the lipstick off my lips. A few more blogger faves have now been ticked off the list. 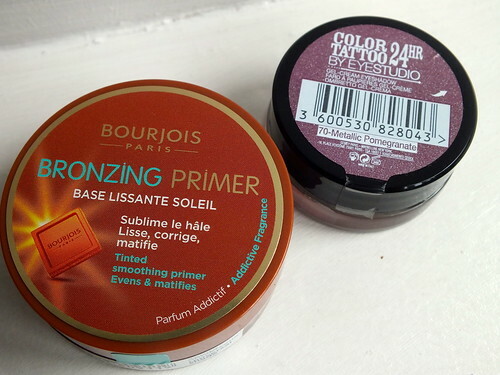 Bourjois Bronzing Primer which I'm still a little scared of so it's reserved for days when I have a bit of time to work with it. Another Colour Tattoo from Maybelline this time in Pomegranate which I've seen used with Mac's Cranberry in a number of tutorials I've watched lately - stay tuned to see if I manage to carry of any of those looks. 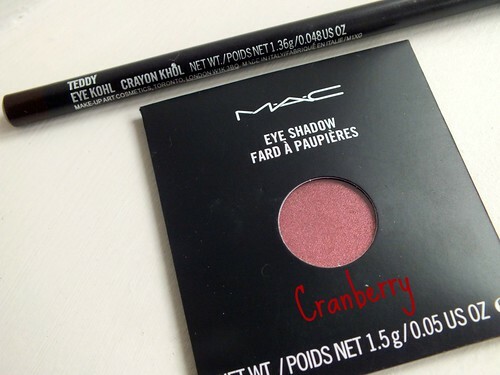 And Teddy eyeliner from Mac. 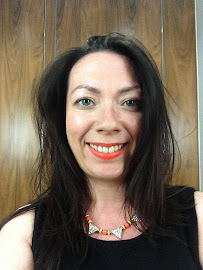 Finally I jumped on the Bourjois Lip Crayon bandwagon with Red Sunrise and love how easy this is to wear and use - perfect for tube journey application. I haven't used Collection make up since my early teens but I'm joining the fanclub for their concealer, it works like a dream and last but no least saving me from shine in the heat Rimmel's Stay Matte powder is the perfect partner. So there you have my goodies for the month, let me know what you've been treating yourself too this pay day or what's on next months wishlist? 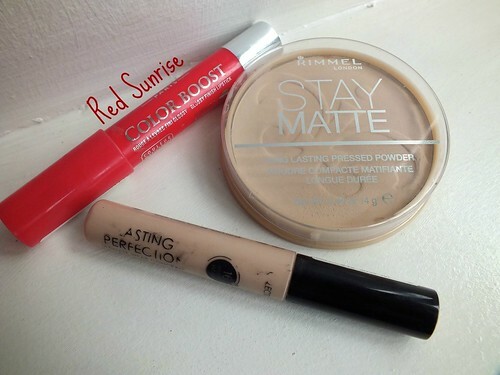 I find I'm using the collection one for concealing and the Rimmel as an under the eye wake up - so far it's working a treat! Awesome haul! I think i may want everything you got especially that yellow nail polish! I dont get paid until next week after not working for like 3months ^_^ im going to have to pace myself! Not at all jealous of your haul... MUCH!! I also bought the loreal solution a couple of weeks ago. It was buy 1 get 1 free in tescos. I've only used it a couple of times so far - HAD to try it yet have another brand to finish first - I'm currently undecided on it... It's a bit more drying than what I have been using, but I shall persevere! Am totally in love with my Real Techniques brushes; so much so that Mr B did two return trips to Ulta for the duo fibre ones when he was in the States before you could buy them here! 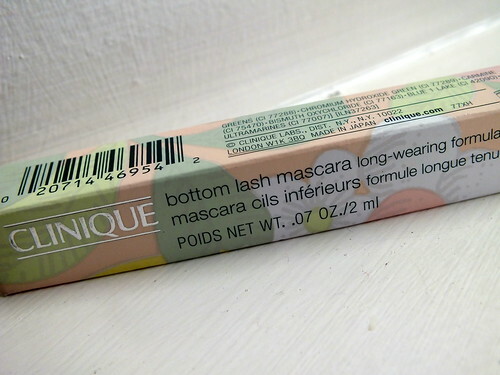 The Clinique bottom lash mascara I have found to be a godsend and it doesn't seem to smudge either. I have Leighton Denny's yellow varnish, Brick Road; love it. Only recently joined your merry band of followers...wish I done it sooner!!! Fabulous payday purchases! This week is payday for me and lookout Walgreens & CVS drugstores!! I love the L'oreal face products for moisturizing the "maturing" skin. That's one of the things on my list for sure, I've been babying what's left in my jar. The rest of my list is like the Dead Sea Scrolls, LOL, so I won't bore you with it! 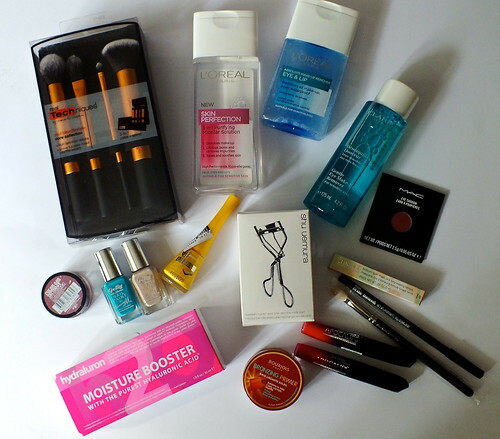 I can't wait to hit the drugstores when I'm in the States October! I love my bottom lash mascara! 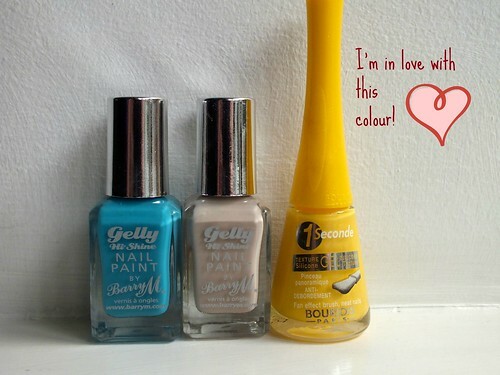 And I have done a review of the bourjois gel polish on my blog! Im popping to MAC tomorrow so no doubt i will spend some money! i just bought some more real techniques brushes yesterday and i'm so excited to use them!! i pondered over whether or not i should also get the core collection, but i feel like that's going to be hauled sometime a bit further in the future. i hear the buffing brush is amazing! Wow, awesome haul! :) I need to try out the Apocalips, they sound incredible!